The postal service ain’t what it used to be in Skyrim. Privatisation, lack of funding – we kid, we kid, but there has been a strange lack of permanence to the game’s courier. He’ll appear for a brief moment, as if carried by the wind, only to leave, perhaps never to be seen again. A true enigma of a man. For more Skyrim mods, check out our list of the best mods out there! As this is the case, one modder has given the courier a place to be, a home. 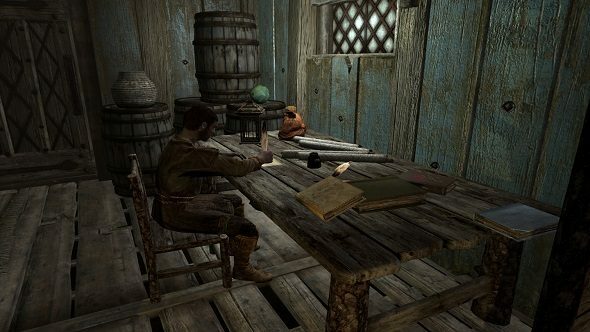 The Provincial Courier Service mod isn’t going to revolutionise your Skyrim experience, but it does give a little love to the courier by giving him a house. Think of it as Skyrim’s one and only post office. There’s a few new features for the courier too – clearly being paid enough to afford a lovely little shack in the suburbs of Whiterun has helped his motivation. Instead of having to wait for the courier to find you, the mod allows you to collect anything from him directly. He’s also able to be more of a postman, less of a courier. You can set him to deliver anything to your house, ready for you to collect after a hard day’s work dragonslaying and thu’um shouting. He’s a good kid, that courier.